mSupply Client software can not see the mSupply Server? mSupply Server can be installed on a range of Windows OS hardware platforms. Installations of the mSupply Server and client software on these different platforms will not be identical. 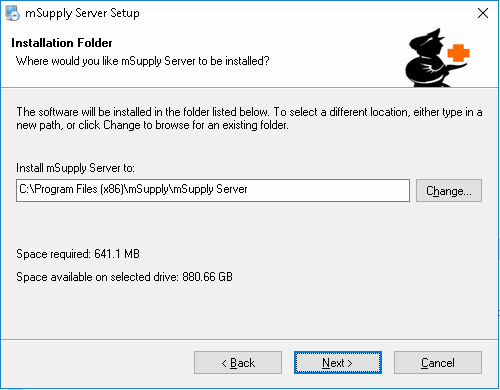 This page includes instructions for installing the mSupply Server and client software on a typical Windows 10 Pro platform. This will include many hardware configuration issues as these have been known to be important for mSupply Server operation and troubleshooting. Indicative pricing before local taxes: USD3,000 to USD5,000. Hard disks are less important, as no data is stored on the server (unless you are using the same server for both hosting the mSupply server and hosting the terminal sessions). Beware of Solid State Drives (SSDs)! At least one country which had several servers with SSDs installed has had the bitter experience of the SSDs failing after ungraceful shutdowns due to failing UPSes. The vast majority of ICT documentation on the internet is written from and for locations enjoying relatively stable power supplies. There is precious little information available for facilities suffering from the sort of chronic power supply issues which the majority of mSupply users experience. We have found only one apparently relevant reference: The mysteriously disappearing drive: Are power outages killing your SSDs?. Even though you have the server protected by a UPS, the batteries will fail sooner or later, and our experience supports the findings in the above article. Avoid the use of SSDs in servers. To achieve performance gains, invest instead in more RAM. The UPS must be able to communicate with the server (usually with a USB cable) to initiate a graceful shutdown in advance of UPS shutdown. For the UPS to protect the server from power surges / spikes, the UPS needs to be connected to a power socket that is properly earthed. More details on configuration of the UPS is contained below. Do you have sufficient in-house ICT capacity to do the rest of the server installation yourself? This server hardware belongs to you (or maybe not… see tip below). However, we know that if the server is not installed and configured correctly, the mSupply software and your medical supplies data is vulnerable. Therefore, in most instances, we end up playing a significant role in installing and configuring the mSupply Server. Over recent years, with the development of reliable and relatively low-cost cloud based server solutions, more and more mSupply client / server installations have used a cloud based server. In many cases, Sustainable Solutions has provided this cloud based server as a separate service, thus relieving you of any responsibility for installation, configuration and management of the mSupply Server hardware. Administrator account called Sussol (mSupply server will operate from this account. Update Windows when configuring the computer on a good internet connection. This will take a long time, so start it when you have something else to do! Don't panic when the update manager reports 0% Complete for a looooong time! While it is good to control when Windows updates take place, it is often beneficial to use Windows Update Delivery Optimization to minimise bandwidth for Windows Updates. It is recommended to turn on Windows Update Delivery Optimization for the server. You may get a notification that a reboot is required. Reboot anyway. A Region window will open, set your preferences on Formats and Location tabs. 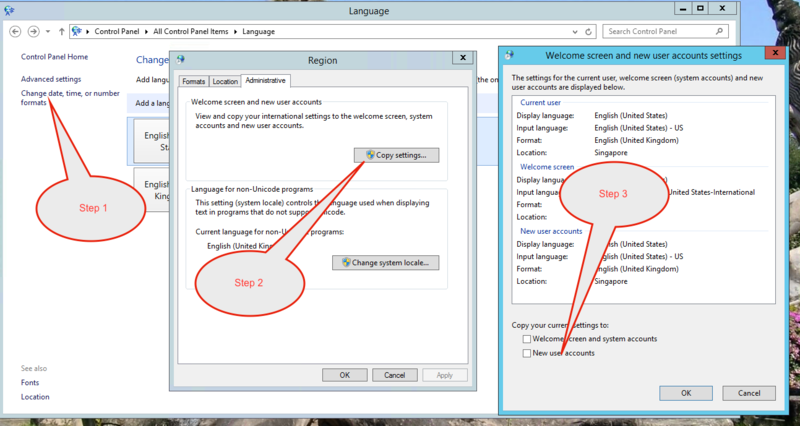 Move it up to the default position and delete the other language option(s). Click on Copy settings button. A window entitled : Welcome screen and new user accounts settings will open. Check New user accounts check box. Click Apply button and then OK button on Region window. Remote access speed gain by disabling visual effects. Go to System → Advanced System settings → Performance and choose Adjust for best performance. Remote access speed gain by removing the background picture on the Windows 10 sign-in screen. Go to Settings (keyboard shortcut: Windows + I) > Personalization > Lock screen. Scroll down and turn off the option, Show Windows background picture on the sign-in screen. To carry out some of the server configuration tasks, file visibility in the Windows OS needs to be improved from the default. Sustainable Solutions recommends using Dropbox to assist with transferring installation files to the server, and as a means of moving mSupply secondary backups off site. Contact Sustainable Solutions to organise a DropBox account for the server and for instructions on setting it up on the server. Do this step first so that you can use the Dropbox folder to transfer software and files to the server. Over the years we have used a number of applications for providing remote support to clients. As of writing this (April 2019) TeamViewer is the software that we use. Get the following three files on to the host computer. It's a good idea to change the host Computer name to something that we will recognise before the running the TeamViewer MSI package (Control Panel > System and Security > System > Advanced system settings > Computer Name > Change…). A name that reflects the site would be useful. The Computer description is NOT the Computer Name. Uninstall any existing TeamViewer installation if it is older than v14.1. Beware if you are trying to Update Teamviewer over the top of an existing TeamViewer installation! It is safest to uninstall TeamViewer before installing the new TeamViewer Host. Execute the batch file As Administrator - refer to method 3 of 9 ways to run programs as administrator in Windows. You must execute the batch file As Administrator. It will not work unless you do. It is not enough to be logged in to a Windows Administrator account and run the batch file 'normally'. Advise Sustainable Solutions once you see this and they will then be able to confirm that remote access is operational. If its not already done, install the UPS hardware and software, refer UPS above. If the OS is Win8 or later, Windows Defender is probably good enough for anti-virus, and better than much of the competition. Once configured, the server should not be vulnerable to exploit programs as these are usually downloaded and triggered by human activity! However, to be safe, it is recommended to install an Anti-exploit program such as Malwarebytes. The website suggests that Malwarebytes is not free, but as at the time of writing this (May 2018), Malwarebytes successfully reverts to a free version after the 14 days trial. This means that it has to be manually run. Pin the browser to the Taskbar. 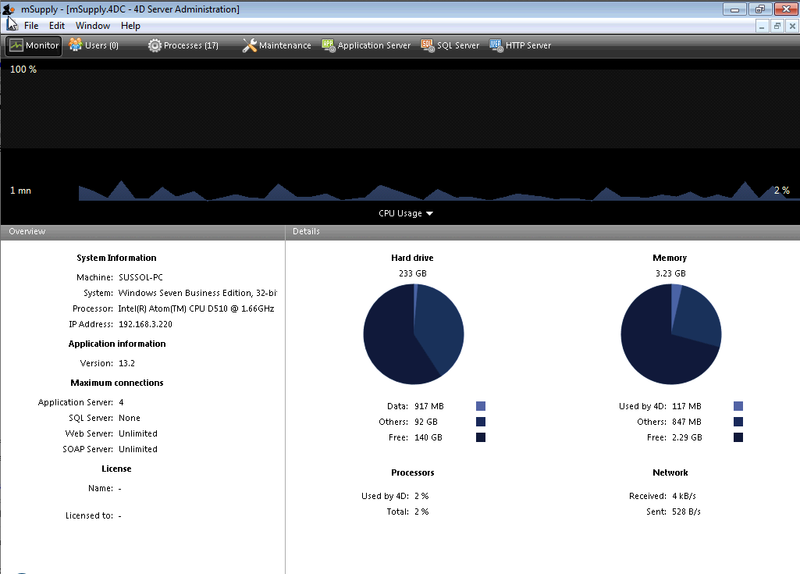 As part of troubleshooting, it is valuable to be able to analyse when the server has shut down ungracefully. TurnedOnTimesView is a simple tool that analyses the event log of Windows operating system, and detects the time ranges that your computer was turned on and whether the last shutdown was graceful or not. Pin it to the Taskbar. The Yellow Lock computer utility needs to be copied to the Admin desktop and then pinned to the task bar. The Green Logoff computer utility needs to be copied to the C:\Users\Public\Desktop folder. This will place the shortcut on the desktop of each normal user. Users of each normal user account will need to pin this shortcut from the desktop to the taskbar. Don't pin it to the taskbar of the Admin user account. We try to keep the Admin account open so as to keep Dropbox working. The C:\Users\Public\Desktop folder is normally a hidden folder. You will likely need to make it visible). 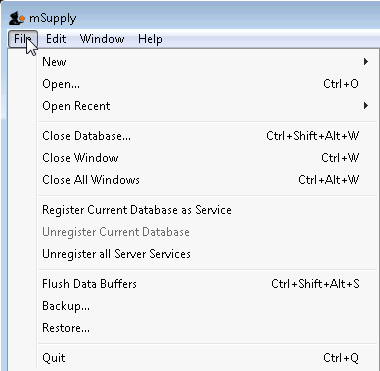 With mSupply server open as an application click on File> Backup…. This will generate a backup file of your current data with file extension .4bk. Copy this file to at least one safe place, e.g. USB drive, a cloud service such as Dropbox. Continue only when the .4bk file has completed transfer to the remote location. There was a major upgrade of mSupply's internal structure in v3.50. If you are upgrading from a pre v3.50 installation of mSupply, Sustainable Solutions will need to convert your data so that it can be read by mSupply versions after v3.50. This conversion process is provided free of charge. One installer, with the word server in the title, is used to install the mSupply Server software on a single server computer. The other installer, with the word client in the title, is used to install the mSupply Client software on as many computers as you wish including on the server computer. You will be limited in how many clients can connect at any one time by the server licence you have purchased. You must be logged on as Administrator to install mSupply Server with the correct permissions. Please consult your IT support staff if you require assistance to achieve this. You are ready to create a new mSupply data file, or you have one to load. mSupply is built on the 4D database engine. 4D Licenses are required for the Client - Server operation. Alternatively, if Sustainable Solutions staff have remote access to your server, they can apply the license. We need to run mSupply Server as an application until all configuration is completed. Don't run as a Service now as some configuration functionality is not enabled when run as Service. We need to run the mSupply Server software as Administrator. There should be a shortcut on the Desktop called mSupply Server. Click Create to create a new data file or Open to choose an existing data file. 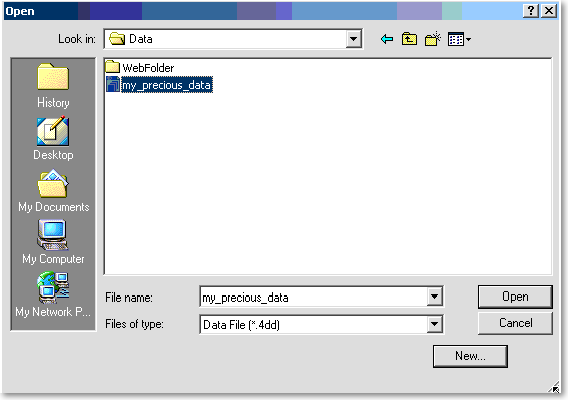 The below image shows an existing data file. You can create the data file anywhere you like, as long as you have read/write access to the directory. To assist with provision of support we recommend that you create a place the data file in a folder called mSupply data inside your Documents folder (My Documents before Windows Vista!). You may get a question from the Windows Firewall requesting permission for mSupply to communicate through the Firewall. Allow mSupply to communicate on both private and public networks. Select Maintenance and then, under the 'band' titled Last backup select Preferences. Scheduler: Set Automatic Backup: to Every day, at 20:00 or later, as long as it is a time when work is likely to be finished. It will have to be set earlier, say 16:00 if the server is switched off of an evening. If on physical hardware, this should be a separate physical disk (e.g. D:\mSupply_backups). If on a virtual machine, it is meaningless to have a separate physical disk, and it should be C:\Users\Administrator\Documents\mSupply backups. 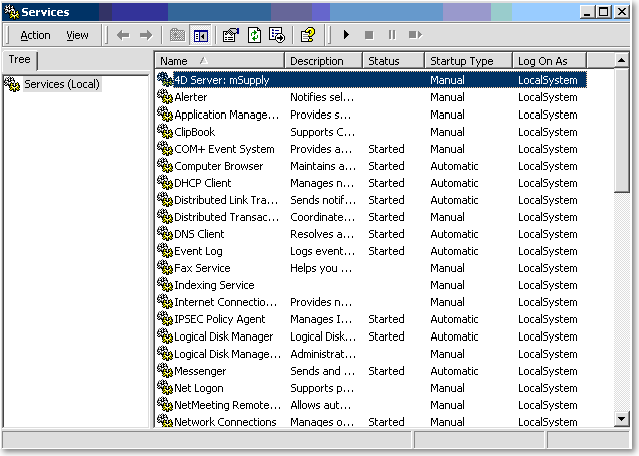 Log Management: Set .journal to the same parent folder as the backups. If on physical hardware, this should be a separate physical disk (e.g. D:\mSupply_journal). If a location of the log file is already specified, and you want to change it, you need to untick the “Use Log” tick-box and then when you re-tick it you will be prompted for a new location. tick Keep only last 60 backup files. Of course if the drive you are backing up to doesn't look like it will have 60x the space one backup file will need then lower the number appropriately. tick Cancel the operation after 3 attempts. Click OK to create the first backup. Tick Calculation of adaptive cache. Settings here are set by 4D on the basis of the system memory. 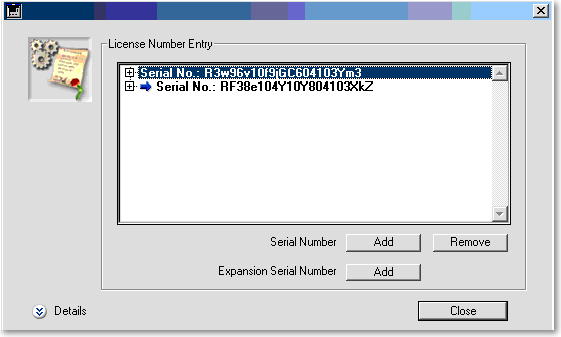 Exit 4D Server Administration window. When you registered 4D server the licence allowed 2 concurrent connections. If you have purchased extra connections, you should enter the serial number(s) now. Click the Add button to enter additional licences. The server should now be set to start automatically when the machine is turned on. This can be accomplished by setting the server to run as a service. Choose File > Register Current Database as Service. If the Register Current Database as Service option is greyed out, you need to quit the server and run as administrator. Type 0 into the box, and click OK . The server will quit. Click on Services in the task bar. You will be shown a window like this. Double-click on 4DServer: mSupply - fortunately it is usually the first item in the list! You will be shown the 4D service properties window. Change the Startup type in the drop-down list to automatic (Delayed start) . Make sure “Allow service to interact with desktop” is checked. Click OK to return to the list of services. You can now start the service by clicking the little play button (right facing triangle) on the toolbar with the 4D service highlighted. Scroll down the list of services until you see Interactive Services Detection. Double click this and then change “Manual” to “Automatic”. Click the Start Service button (see the button in the red box above). At this point the status should start reporting either “started” or “running”. Click the red X to close the Services window. Once finished editing the registry, close regedit and return to the list of services and start the ISD service. It should now start! From now on the 4D server will start automatically when the machine is turned on. There is no need to log-on to the machine. 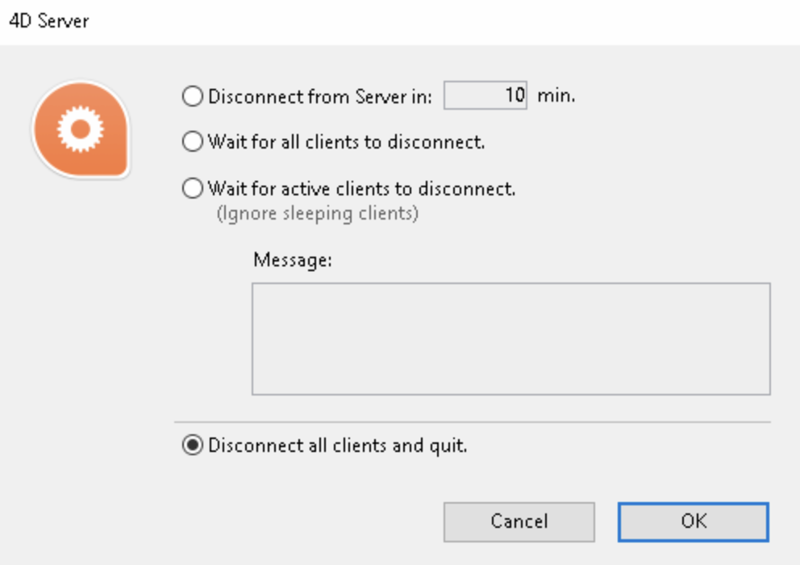 To stop the server, make sure clients are not connected, then choose File > Quit on the server. Now that mSupply server is running as a service, we want to make it difficult to accidentally run the mSupply application manually. We recommend that you delete the mSupply Server shortcut. From this point there should be no need to revisit any of the above procedures to operate mSupply. However, if you are testing, or starting a data file for a second organisation, you may wish either to change the data file mSupply is using or to create a new file. The mSupply program (the files named “mSupply.4DC” and “mSupply.RSR”) store the path to the last data file used, and the next time mSupply is started, the previous data file that was open is opened again unless there is user intervention or the “old” data file has been moved to a new location. To intervene, hold down the “alt” key as the 4D server starts up. To create a new data file, click the “New” button. 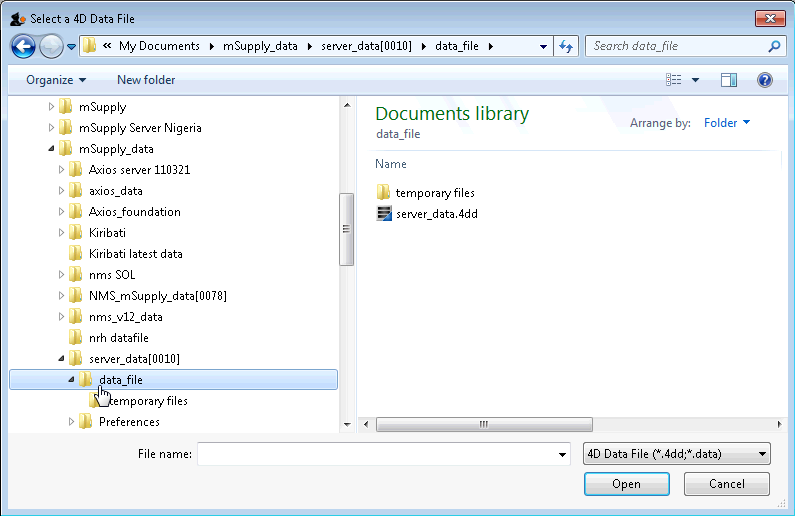 To select an existing data file, navigate to the file's location then click the “Open” button. Needed: mSupply Client software of the same version (or relatively recent) as the mSupply Server. The mSupply server should run as a service on the server computer - see above. If any user needs to use mSupply on the server (not recommended, but possible, and sometimes necessary) then they should not be running the mSupply Server software. They should run the mSupply Client software, which should be made available to all user accounts. Generally, mSupply will interact correctly with the local OS in terms of date format. However, as OS versions continue to evolve and handle dates differently, sometimes this does not work. We have found that very occasionally, if the OS date format is set to DD-MMM-YY (e.g. 20 APR 2020) then mSupply will not always handle the date well. It is recommended to set the system date to DD-MM-YY. You must be logged on as Administrator to install mSupply Client with the correct permissions. Please consult your IT support staff if you require assistance to achieve this. Once you have obtained the mSupply Client installer file, double click it to install. The mSupply client will be installed in the folder C:\mSupply\mSupply client on your computer. A shortcut on the Desktop called mSupply client. A folder called “\4D\Network” in the Windows folder on the startup volume, which contains network component files that need to be present for 4D to communicate over a TCP (and other types of) network(s). Note that no reports are installed on 4D client. Each time 4D client connects to the Server, reports that have been added or modified on the server are automatically copied to the client. Note that the installers have been set up to overwrite existing files, so reinstalling the software will restore any potentially corrupted files to their original state. The installer will not overwrite your data files, unless you have been unwise enough to name your data file “example data” and put it in the “example data” folder;-). For convenience, pin the mSupply client desktop shortcut to the taskbar. If any other Windows users will use this computer to access mSupply, it is worth copying the mSupply client desktop shortcut to the C:\Users\Public\Desktop folder. This will place the shortcut on the desktop of each user. Each user will need to pin this shortcut from their desktop to the taskbar. The window lists available mSupply servers on your network (there should be only one!) Click on the server you wish to connect to. Once you have connected successfully, the mSupply Client 'remembers' which Server you last connected to and stores this in the Recent tab. Whenever you run the mSupply Client, it will automatically connect to that server. 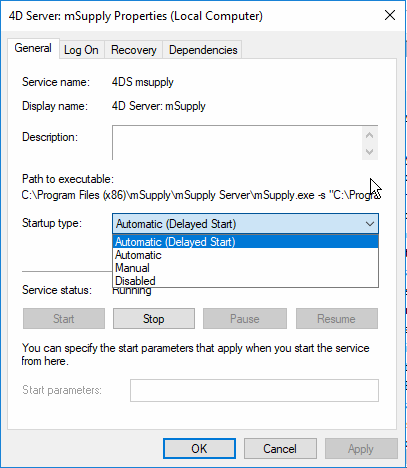 If, mSupply Client cannot connect to the mSupply Server, this window will pop up showing the Recent tab. You can try choosing the server there. If, for some reason, network settings have been changed and you cannot connect from the Recent tab, remember to look at the TCP/IP tab as well. To make it easy for you to connect, mSupply Server publishes details about available servers on a specific port. It is quite possible that products such as “Zone Alarm” and “Norton Personal Firewall” will block access to this port and stop discovery of the servers. Contact your system administrator if the list of available servers is blank. Of course, it may be possible that the mSupply Server service is not running. Check Services to establish that. 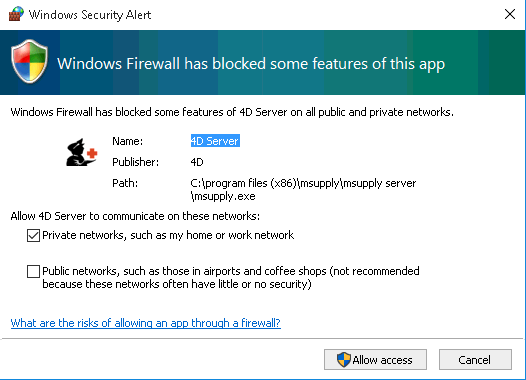 Lastly, the Windows firewall may be blocking the Server publishing it's presence - see below. 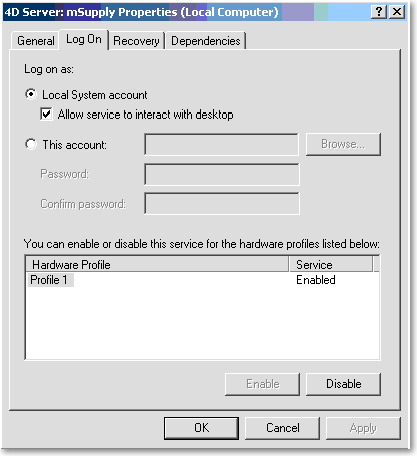 The Windows firewall may need to be adjusted to allow the Client to receive Server identification. When you launch 4D client, it broadcasts a udp message on the subnet, requesting all 4D servers to identify themselves. When responding, each 4D server replies with a UDP unicast message from its address to the client's address with source port = 19813 and destination port = whatever port the client had used to broadcast. So in order to let the client receive the answer back from the server, one has to punch a hole in the firewall for all UDP packets with a source port of 19813. You will either have to phone or email the information to Sustainable Solutions to obtain a registration code. The registration code is keyed to your Organisation name and the MAC address of the server. Changing either of these will require a new code, which we shall willingly provide. So, take care when setting the Organisation Name! Your installation of mSupply may have customisations made specifically for your work scenario. Please contact our support staff on support@msupply.org.nz to manage these customisations. Your mSupply server should be attached to a UPS. The UPS should be fitted with a control cable (serial, USB or network cable) that allows control software to detect a low power situation and shut down the server. In the UPS control software set the shutdown to start at least two minutes before the power will fail. Access to a cloud hosted mSupply server is through the Windows Remote Desktop Protocol. If the mSupply client software is running on a PC, there are a range of applications that can be used for accessing the cloud hosted mSupply server including Microsoft's own Remote Desktop Connection software that comes included with Microsoft Windows. There are third party implementations that provide additional security and controls. One that we are currently (2016) finding effective is TS-Plus. The Computer Name is the name of the domain name of the mSupply server computer that you are connecting to.